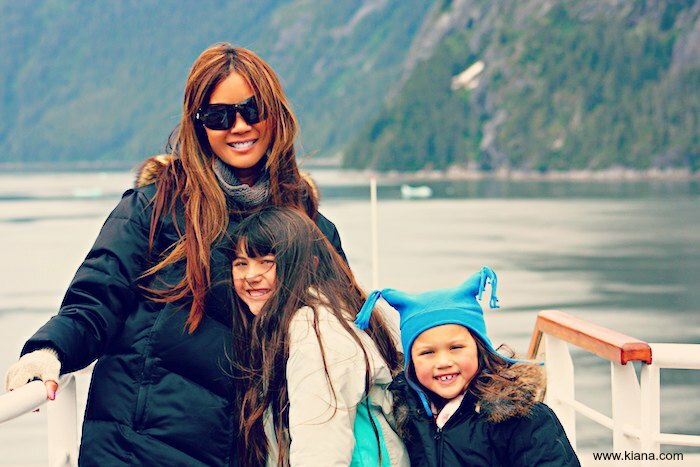 Family Travel Cruise to Alaska. Walk on a glacier, see wild Orca swimming free as bald eagles soar overhead, go dog sledding, fishing, see real totem poles, go kayaking, visit local shops for unique treasures! An adventure every day! If you’ve never been to Alaska, you must go! It truly is a bucket list type of trip. The best way to visit is on a Cruise. I am not usually a Cruise person since I like to go to different places and stay as long as I want, but this Cruise I highly recommend. Plus Cruises have come a long way from the mass produced buffets. This was my 2nd Alaskan Cruise. The first was with ahem, Door #2 (aka fiance #2 😛 and a very different type of vacation as opposed to this one being married and having a hubby and kids to “live for,” if you know what I mean. At that time in my life, I participated in all types of potentially dangerous things. Not a “what if” in the world. I don’t regret anything but am so happy I experienced all of the adventures before having kids. Not sure I would do them now! I would not feel comfortable doing those things now as a wife and mother of 2 precious angles who need me 🙂 I guess I have the best of both worlds. The next risky thing we did was to take a small float plane to Taku Lodge for dinner. It was really fun because the plane landed in the water. We then went to a home to have a private barbecue salmon dinner. The risky part was a gigantic brown bear that climbed onto the barbecue to lick the salmon pieces off the burning grill. Can’t believe he didn’t burn his tongue or his paws. Being the genius we are, we all go outside to get a closer view!? Yes, I brought a camera this time. Many people on the boat didn’t bring their cameras or ran out of batteries. They gave me their emails and to send them my photos. AWE. APPRECIATION. SERENE. SMALL. PERSPECTIVE. STILL. QUIET. THANKFUL. We had taken an excursion to see whale. We had only been out for about 15 minutes when we saw a herd of 3. They breached and dove quietly under the ocean as eagles soared above. I was literally frozen and in awe and could not move. I’ve seen whale so many, many times in Hawaii but this is so different. It is so vast, so cold, so quiet, like a vacuum. I’m so happy I had my camera and took this photo as this gigantic creature silently dove under the water. The guide told us this one was about 25 feet long. His tail span seemed about 40 feet wide. I love love love to see animals in the wild where they should be. Playing happily without care, not stressed. Not performing. Not couped up in a swimming pool. We will N E V E R go to Sea World. We flew from LAX to Canada and caught the Cruise ship in Vancouver. Smooth flight, it’s so much easier flying now with the kids out of diapers! 🙂 I always pack healthy snacks to eat on the plane! The cruise was scheduled to stop in Tracy Arm Ford. Gorgeous! the glacier in the center back of the photo is gigantic. I wish there had been a boat so you could appreciate how huge it is. Each chunck of ice is the size of a Bus! This gives perspective as to how vast and gigantic TAF truly is. It was so quiet, you could only hear the wind and the water as our Cruise Ship cut through the cold water. This is an excursion boat (not a cruise ship) but still gives perspective 🙂 I took this photo of another boat cruising through Tracy Arm Ford in Juneau. It was really really cold while we stood on the top deck to take in the beautiful sites! Fun time for this beach girl to make use of my warm clothes & jackets! Kids are never cold! There were Glaciers and rock walls over a mile high with waterfalls that cascade down into the freezing water. We saw whales. Eagles. Bear. AND Alaska’s largest icebergs. This was about the size of 4 football fields. Wish the excursion boat were nearby for size perspective! This was HUGE! The back drop was also spectacular: ice peaks poking thru white wispy clouds. You could see the clouds moving fast, as if they were playing hide and seek with the mountain tops. Being out in the water seeing this view makes you appreciate nature so much and wonder why we spend so much time on tech. My daughter, Anelalani, is the “animal whisperer.” Every animal we’ve ever seen, takes to her immediately. When we go to a ranch, horses trot over to see her. Fish swim around her. Birds land on the car near her. Really! The shops were really cute. Kiana Jr. wanted this adorable Eskimo doll! I LOVE & ADORE this photo of her! She looks like a cute little Eskimo Doll. It is burned into my mind so I never forget this moment. She is so adorable here. How could anyone say NO? Lots of fun shops to buy local souveniers. One of the things that I didn’t love was the commercialism at the local towns. We were told that big companies owned the little shops that were created to look “local” which would be a disappointment thinking you got something hand made and in fact, it was mass produced over seas 🙁 We were also told that the big “push” for us to buy jewelry was due to the fact the Cruise ships were paid money to bring tourists to their shops. Hm. Wouldn’t surprise me, but shop carefully, that’s my recommendation. We had fun being tourists and even rode a horse and buggy and saw this funny “flower bed” which I thought was so clever! EVERY NIGHT ON THE CRUISE THEY HAD WONDERFUL DINNERS. WE CHOSE THE OPTION TO GO TO ANY RESTAURANTS ON THE CRUISE SHIP, INSTEAD OF BUFFETS. IF I AM GOING OUT, WHY WOULD I WANT TO SERVE MYSELF? If you ever get the opportunity to take a Cruise to Alaska, you will LOVE it! Truly a different type of cruise that can be as active or as relaxing as you want. Aloha beautiful Whale! Okole Maluna or Bottoms Up!